Chinese police have found a unique way to identify potential criminals and fight crime. 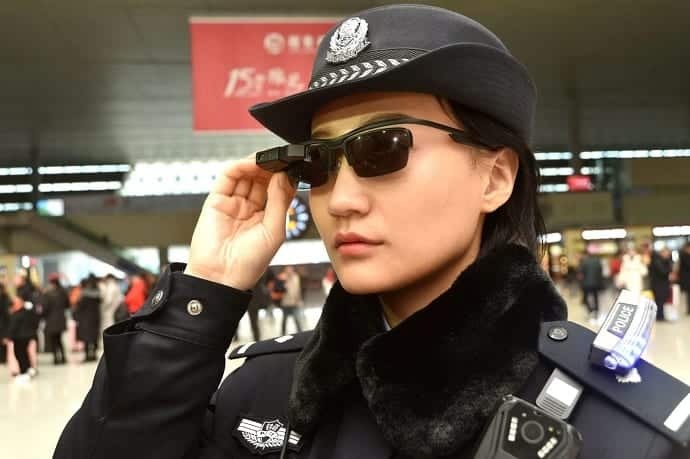 Police in Zhengzhou, the provincial capital of Henan Province located in east-central China have introduced high-tech facial-recognition sunglasses to arrest offenders in the province’s railway station, according to the Communist Party’s official newspaper People’s Daily. Liu Tianyi, at LLVision, the firm that developed the GLXSS Pro smart glasses, says the glasses are so light that the police officers can wear them all day. The glasses have a small camera attached to a smartphone-like device that allows the officers to take photos of suspicious individuals and run the headshot in their database. Using the technology, the database can in real time provide individual’s personal details, including name, ethnicity, gender, address and criminal records. All the information would be transferred back to the officer’s glasses. It also informs officers whether the suspect, the hotel address where they are staying and even their recent Internet history. “The glasses — which resemble Google Glass — are connected to a police database that can match passengers with criminal suspects,” said a report in the People’s Daily online. “The facial information captured by the glasses will be sent back to a database for comparison with the information of suspects on the wanted list,” Zhang Xiaolei, an employee at the publicity office of Henan’s Department of Public Security, told the Global Times on Tuesday. With the help of these high-tech sunglasses, police at the Zhengzhou East Railway Station have nabbed 33 suspects, of which 7 are accused of human trafficking and hit and runs, while 26 are accused of using fake IDs. However, these programs have drawn strong criticism by human-rights groups and privacy advocates, who say that the implementation of this technology invades on people’s right to privacy.